Discussion in 'Dynasty' started by Snarky's Ghost, Oct 9, 2018. Having just completed my marathon viewing of Season 5 (preceded by my marathon viewing of Seasons 3 and 4) I realize now, quite clearly, that just as much-reviled guest character Wes Parmalee simply was the heart of DALLAS, demonstrating and exemplifying all the elements that defined that series, indeed much-reviled guest character Lady Ashley Mitchell, portrayed with dazzling incompetence by Ali Mac Graw, absolutely defines DYNASTY and all that the show is. Lady Ashley Mitchell quite simply is DYNASTY. No other character quite taps into that vibe as purely and as sincerely in her insincerity. I liked her title card...but Dynasty did that so well. Lady Ashley did not die--she simply used one of her many passports and plastic surgeons and came back as Frankie. I may have seen Murder by Death too many times as a kid, but every time I hear "n'est-ce pas" I want to reply, "I don't think we have nespa Sir, just Hersheys." How dare you. Well at least she knew how to catch a titan! I think I've seen her in an old Carol Burnett sketch. She played an overrated actress. Who? Ali MacGraw? Katharine Ross? Madeline Khan? Somebody else? Ali McGraw and Katharine Ross--two peas in a lukewarm pod! Each becoming famous early on as a young ingénue and then skating off that until obscurity by mid-70s and someone digging them up mid-80s. At least McGraw somehow worked on Winds of War (where Spelling remembered her). But I think Ross' casting was someone at the helm having a teenage crush on her since The Graduate. Then again, I may be unfair, and they may have thought she was perfect to play Frankie after The Stepford Wives. But I think Ross' casting was someone at the helm having a teenage crush on her since The Graduate. Then again, I may be unfair, and they may have thought she was perfect to play Frankie after The Stepford Wives. Watch "Secrets of a Mother and Daughter." I thought she was waaaay better in that than on THE COLBYS. And it was made only 3 years prior! She also played in the critically acclaimed "Donnie Darko". But anyway, I think Lady Ashley should have been more eccentric and intellectual - a different kind of threat. Someone who thinks she's above competition, someone who likes the library talk while sipping Blake's favourite Cognac, a horse whisperer (better than Krystle) and all those things that the other Dynasty divas weren't. I think Lady Ashley should have been more eccentric and intellectual - a different kind of threat. Someone who thinks she's above competition, someone who likes the library talk while sipping Blake's favourite Cognac, a horse whisperer (better than Krystle) and all those things that the other Dynasty divas weren't. That would have been perfect. And it would have broken the mold of the female characters either being a "Krystle" or an "Alexis." Actually, Lady Ashley was one of the most important characters in the show's history - without her the Colbys never would have happened (not a bad thing, really), Fallon's pic never would have been seen, etc. But that implies a competence that just isn't DYNASTY. We must…keep on fighting it. If it's Frankie were talking about a titan isn't the only thing she's caught. Gee, I guess I should have phrased it: "her expiring gloriously...."
We got Frankie, Bliss, Hutch, and fake Fallon because of her? I am thinking Lady Ashley is DYNASTY's kryptonite. Well, Camille Marchetta's year was the year of the fairy tale, so she could have flown in on a broom. I don't get the casting of Ali McGraw and Rock Hudson that year. 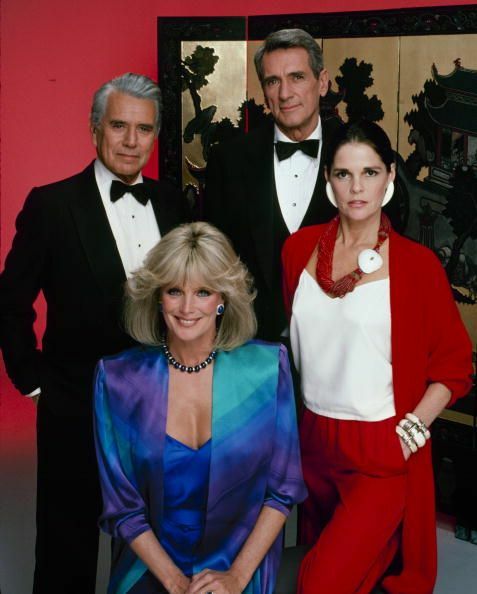 DYNASTY was at that point #1, so why did it need stunt mothball casting? The one thing the show did best, even at its worst, was take actors not known in the US audience and give them a role that fit like a glove. Ben, Caress, or Sable in THE COLBYS were such examples. Instead they had Charlton Heston instead of a different seasoned actor (with less ego and more flexibility) in late 1985 and earlier on DYNASTY Rock Hudson who, AIDS aside, was such an established image, he couldn't any more play a new character, just himself pretending to play a new character. Mac Graw was not their first choice as Lady Ashley -- they'd apparently gone after Elizabeth Taylor, Angie Dickinson, Raquel Welch and Candice Bergen, all of whom said "no". With Rock Hudson, they probably just thought A-list movie icon from near the end of Hollywood's Golden Age, unaware of how he was beginning to look. I always want them to keep Billy Dee Williams, an innate star and masculine anchor the show needed more of, pay him enough to stay, and let him usurp Hudson's role: it was Brady who bedded Iris and sired Sammy Jo!! And I still want a Jacqueline Bisset for Lady Ashley.